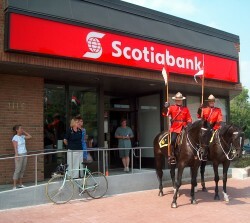 Scotiabank is one of North America's premier financial institutions, and Canada's most international bank. Since welcoming our first customers in Halifax, Nova Scotia, in 1832, Scotiabank has continued to expand its global reach. Today, through our team of more than 70,000 employees, Scotiabank Group and its affiliates offer a diverse range of products and services, including personal, commercial, corporate and investment banking, to some 18.6 million customers in more than 50 countries around the world.